The Moscow metro is a single kind of public transportation which runs strictly according the schedule in hectic megapolis with 24 hours traffic jams. More than 7 million commuters daily use this transport system during business week. 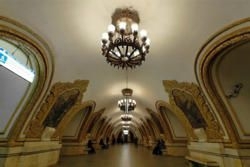 During Stalin era metro has become a symbol of Soviet regime advantage over capitalism and the best architects and artist were involved in the creation of underground palace. It is a definitely must see attraction in Moscow. Moscow metro is sometimes beautifully decorated, in fact, it looks like an underground museum. Of course navigating Moscow metro can be tricky, especially if you are not so familiar with the language. However, head straight to the official Moscow Metro Map for a handy guide with Latin letters, a description of each metro station and a great tool that calculates the exact time it takes to travel from any one station to the other! Trains run from 6am to 1am and you will rarely wait more than 3 minutes for a train. A reasonably priced Metro tickets and smart cards could be an option for someone who is planning to take more than one journey by metro. These tickets and cards are valid for a fixed number of journeys or during a fixed period of time, irrespective of the distance travelled and the number of transfers. 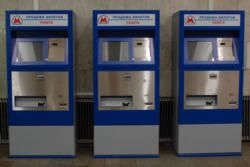 At the ticket office and vending machine there are one/two ride cards which are valid for 5 days and may be used in all kinds of transport: buses, trolleybuses, trams and they cost 50 roubles per ride. 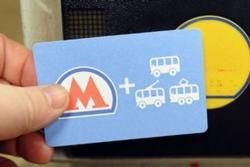 The other cards for 5/10/20/60 rides, you can use for 45 days including the day of purchase. For tourists there is a special smart card for one day, it costs 210 rubles and is used for all kinds of public transport. If you plan to stay in Moscow for a long time, it is convinient to use Troyka card - electronic replenishable card, the ride with Troyka will cost you 30 roubles per ride in metro and 29 roubles in all other kind of public transport. Metro ticket for a single ride costs 50 roubles and can be purchased at station ticket office or in ticket vending machine (only single and double tickets available). Vending machine has English menu which is very handy! There is no special zones - all the metro is one zone, and there's no time limit for using your ticket. Also, forget about the feeble and slow-closing doors of the London Underground, Moscow's subway train doors operate with both efficiency and speed, so you would be ill-advised to mess around. 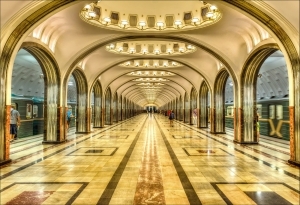 Go around Moscow fast and efficiently using one of the oldest and most beautifil underground systems in the world.